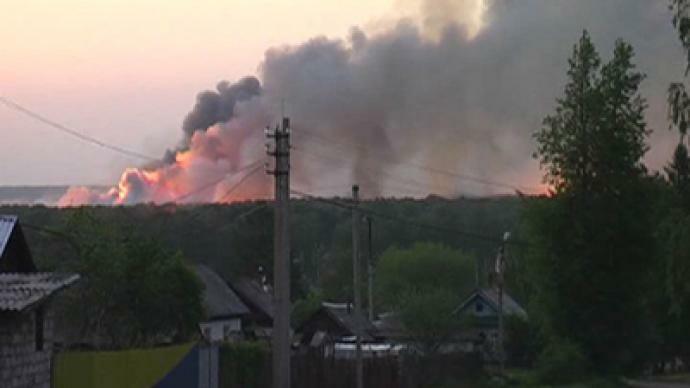 Emergency crews have extinguished the fire at a munitions depot in the Russian Republic of Udmurtia. 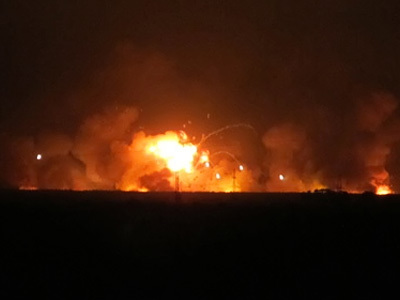 86 people have been injured after a major fire at the military unit set off a chain reaction of artillery shell explosions on Thursday evening. 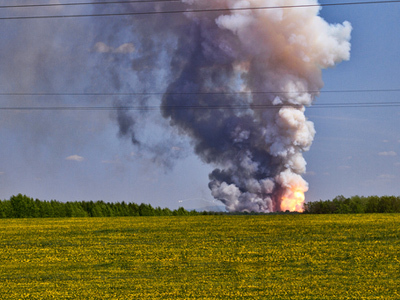 By Saturday morning, over 24 hours after the fire broke out at an ammunition depot near the city of Izhevsk, Udmurtia, the blaze was contained. In a while, Russia’s Defense Ministry told RIA Novosti news agency that all fire spots in the area have been extinguished. Few forest areas around the storage are still smoldering, but they are not on fire, having been doused from the sky. The operation utilized up to a thousand firemen. In addition, trucks, helicopters and other aircraft were deployed. Throughout Saturday, the odd explosion could still be heard at the depot every hour or hour-and-a-half, said a local Emergencies Ministry representative as reported by RIA Novosti. These blasts were accompanied by controlled explosions carried out by the Special Forces. The forces together with disposal experts have been working around the clock to make sure that any ordinance that has been damaged by the fire can be safely put out of harm’s way: so that it does not detonate itself or cannot be set off in any other way in future. Initially some 30,000 people had to be evacuated from the area surrounding the ammunition depot. All evacuated residents, except for 400 children, had returned to their homes, the Emergencies Ministry announced late on Saturday. When the fire broke out on Thursday night, eyewitnesses saw huge flames and massive explosions at the depot area. As the explosions started, some were still wearing slippers and nightgowns when they ran outside. “I was pulling on my jacket when I heard a shell running into my wall. The plaster began falling off. I grabbed whatever I could and started running,” one of the eyewitnesses told RT. The fire that hit the depot deployed over 170,000 tonnes of weapons that were stored there. The explosions which followed left dozens of people injured and requiring medical attention. Doctors at the local hospitals say that most injured they have been receiving are actually rescue workers, Emergencies Ministry personnel and firefighters working at the place of the incident. They are suffering from burns and bruises caused by glass flying off the windows broken during the shockwaves, which the exploding ordinance sent as far as ten kilometers away from the epicenter. The village located in the area of the depot is home for dozens of elderly people. They had to seek shelter in basements and then were rescued by authorities. Two elderly people suffered heart attacks due to stress and died. Most people in Izhevsk are receiving psychological help for the dramatic experience they have gone through. The fire not only disrupted locals’ lives. Several trains have had to be cancelled; replacement buses have been put on. Some oil pipelines running through the area had to temporarily slow down or even stop the flow of oil. By now, normal oil supplies have already been resumed. This explosion of the ammunition store is not the first incident of its kind. 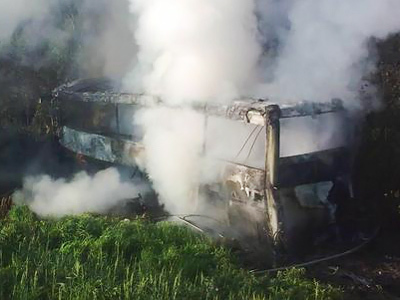 In Bashkiria, a republic in Russia’s south, a similar fire took place just last week. 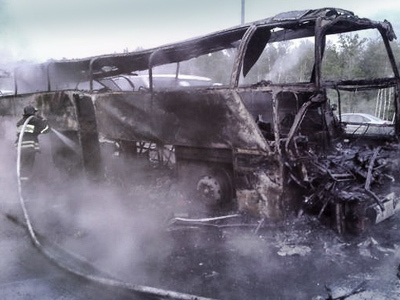 “Two military depots fires in the span of two weeks – a pattern is emerging. The Defense Minister must report who will answer for that and how. Since certain people failed to draw conclusions – we’ll have to strip them of their shoulder-decorations,” said Medvedev.